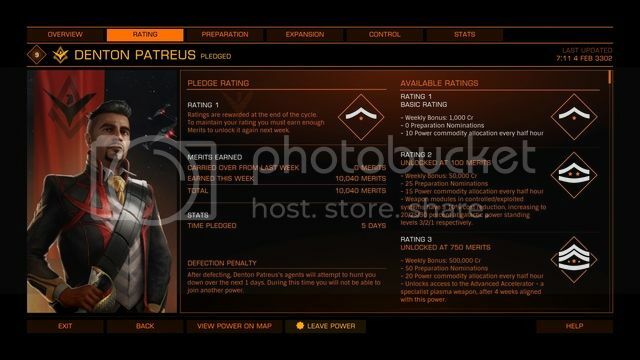 I am hoping to create or join a private group & wing up, to hit the military strikes to rank up to level 5 for Denton Patreus. Currently they are in 23 Delta Piscis Austrini. If not, anyone interested? I am in the UK and play most evenings. 6:30 - 11pm. I am running an A class Clipper, but you just need a half-decent combat craft. doing quite well on my own. Should be rank 5 by tomorrow night. Anyone else need 50 million credits? What the heck am I going to spend all these credits on? Oh - yeah I know. The anaconda. Well, after 4 weeks at rank 5 it is time for me to part ways with Patreus and head on over to Aisling Duval. It has been a tad grindy (but what isn't in ED?) But I now have a shiny Cutter in place of my trusty Anaconda. 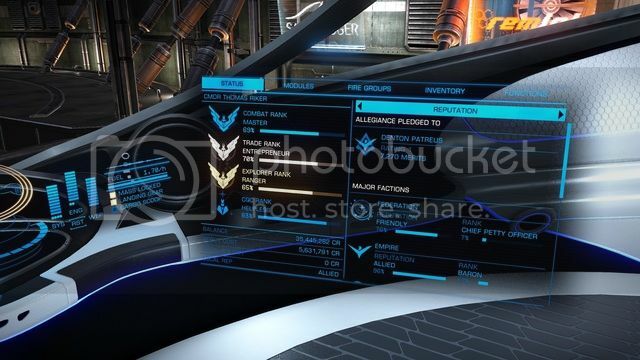 I have the APA's on a couple of ships and I will buy another Vulture to store another 2 - just in case. 1) "only" get up to 6000 merits this cycle. 2) collect final rank 5 salary on Thursday. On my way to rank 5 too, going to grind for few days in Anganaha military assaut zones. Look me up if you want to wing up. You can sure make those merits quickly in there. Jack Dunhill wrote: On my way to rank 5 too, going to grind for few days in Anganaha military assaut zones. Look me up if you want to wing up. LMAO - we did the other day. It's done - I have defected! SO you end up with half the merits you had before the defection, so I am down to 1560 points. This gets me rank 4 with Aisling Duval, so I am currently grinding out the merits to get back to 10K. unfortunately I haven't found an effective combat method just yet. At 25 merits per 30 mins, I imagine it will cost me a fair few credits to get back to rank 5.